Casinos and the whole gambling world have a lingo of their own, a whole set of terms, such as the Dead Man´s Hand, and others which can be confusing to the inexperienced player. The idea of these series of posts is to have a list that is accessible to our readers and that can be useful to you when you hear one of these expressions. All In: This one is used for other skill games and sports to refer to the way in which one can approach a situation. In poker “all in” refers to when a player bets all of his remaining chips. Banker: This is the name given to the dealer or to a player who books the action of the rest of the players on the table on a card game. Basic Strategy: Commonly used in blackjack when speaking about the recommended set of plays you should perform to maximize your game. Betting Limits: This term refers to the minimum and maximum amounts of money that you can wager on one bet in a table game. You cannot go over or below the established limits. Bluff : A bluff is when a poker player raises the stakes when holding a weak hand, hoping that this action deceives and drives out the other players with stronger hands. Bust: A bust is when you go over twenty one during a hand of blackjack, If you bust you lose. Button: There is a small plastic disc known as the button, used to designate the dealer position on a poker table. It will move from one player to the next after each hand. Call: This one has different meanings depending on the game; in poker when you call it means that you are matching the current bet on the table. In the games of Keno and Bingo, you call when you draw the numbers for each game. Casino Advantage: Also known as “The edge”, is the advantage that the casino or “the house” has over the players. Check: Another term that has more than one meaning; in poker when you check you are deciding to stay in the game without a bet. As for casino in general, it is another way to call for a chip. Chips: These are the tokens that are used to play casino games instead of cash. Credit Button: commonly seen in casino slots and video machines, it allows players to bank coins in the form of credits. Croupier: this term is mostly used in the games of Roulette and Baccarat; it is the French translation of the word dealer. Cut: It makes reference to when a dealer on a card game divides a deck into two parts and inverts them after they have been shuffled. Deal: It refers to the action of giving out the cards during a hand. Die: Is the singular term for dice: one die, two dice. Discard Tray: Where the dealer places all the cards that have been played or discarded, it is a small tray located to his right side. Double Down: During a game of Blackjack, a player has the option to double the original bet in exchange for receiving one additional card. In order to do it, the player turns over the first two cards he was dealt and has to place a bet matching the original one. Draw Button: This button allots the player to draw up to 5 new cards during a game of video poker. Even Money: It is usually shown as 1:1. Even money is when you will get paid back the same amount that you wagered. Face Cards: It makes reference to all the cards from any suit which are: the jack, queen, and the king on a deck. Fold: When a player declines a bet and drops out of a poker hand, this is known as a fold. 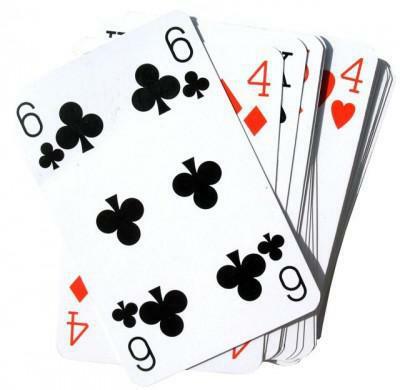 Four Of A Kind: It refers to four cards of the same rank, this is also called quads. Full House: This is also a poker hand, this time formed by three cards of the same kind and a pair. Hit : A hit is what you call it when you want to take another card during a hand of blackjack. Hole Card: In blackjack, the hole card is a facedown card that the dealer gets. In Stud and Hold’em Poker, the facedown cards get dealt to each player. House Edge: It is a percentage of every bet that the casino retains. In traditional casinos, the winning bet is usually paid with a less than the true odds so that it generates some income to the casino. Insurance: On a game of blackjack, you are offered insurance when the dealer’s first card facing up is an ace. When the insurance bet is played, the wins are double if the dealer has a natural blackjack, but it is a loss if the dealer doesn’t. Jackpot: This is usually referred as a big win on a slot machine; it is also the name for the cumulative prize. Kicker: In a draw poker game, it’s an odd high card held that doesn’t contribute to a straight or a flush, usually an ace or a king. Limit: It refers to any game where there is a fixed limit on how much can be wagered or raised per round on a poker game. Marker: A check that can be written at the gaming tables by a player who has established credit with the casino. Muck: When a player cannot win or did not win the pot, the act of throwing away the cards is called the muck. Once they are mucked they cannot be used to win. How many of these expressions did you know?